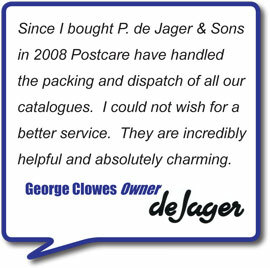 We are MORE than just a mailing house! We provide a wide range of additional services, to provide you with a comprehensive, quality solution to your mailing requirements. We can put you in touch with the right people at Royal Mail to open your own account. Alternatively, for a minimal cost, you can use our existing and established account. All postal charges are invoiced on a pro-forma basis and accounts must be paid in full prior to mail being collected. Postcare offer a full poly-wrapping services for multiple documents, up to A4 in size. Combining poly-wrapping with our other mailing services can result in a very cost effective marketing campaign. We can supply and print envelopes to your requirements. We offer Royal Mail signed for services, for when you need you mail has arrived to it's destination. Contact us to see if we can supply what you are looking for. ...and much more. Contact us to see if we can supply what you are looking for.